I know you’ve seen this around, they’re best ornamental plant for house corners as they have large, lush, green with white speckled leaves. They sure liven up dead spaces. But so much for that, the idea of looks can be deceiving is so true in this case. 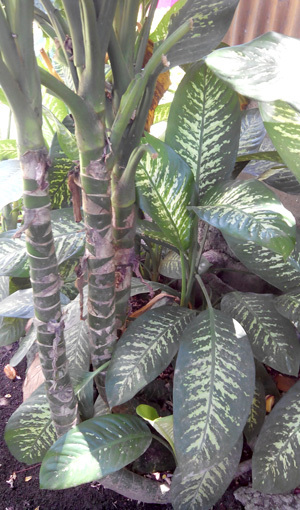 I should write about this to warn you ladies that, if you are growing this ornamental plant in your house, then you are at risk and vulnerable to getting extreme itch and painful experience should you accidentally or happen to prick its stalk or touch or get in contact with its sap. Lately, I had my most grief-stricken experience with this plant and I don’t want it to happen especially to your kids or to anyone, even to my most despised enemy. The old folks here at home grow this plant to cover the back of our service bathroom. It’s a detached bowl and bath which serve as a rescue room in case anyone in the compound (with 3 houses) would do number 1 and 2. And our clothesline is attached to the west side of this structure. So one unfortunate morning, without prior knowledge about the venom of this plant, I pricked and folded the leaf stem that beamed toward the clothesline. In seconds, I felt like there were tiny blowguns shooting on my fingers. I immediately washed it with soap and water but all the more it tingled pain and soreness. I thought the pain would just wore down, but hours later the pain came back in with a matching itch, not just itch, but burning itch I cannot disavow the feeling no matter what form of psychological refutation I have to exercise. My fingers begun to swell like Virginia sausages with pink speckles on it. God, I feel awful! And then the flesh went hard and numb, I can't close my hand. they're really useless piece of extremities at that point. 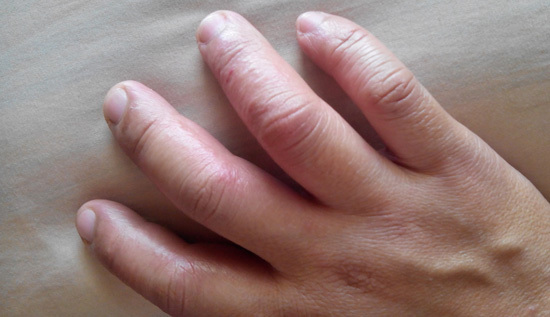 I had stronger topical, Halobetasol Propionate. Ingestible anti-inflammatory, Prolix and Iterax. I endured the horrible ‘painitch’ for three days. I had to device a way how to scratch my infected fingers hard without cutting my skin. The itch was too controlling, but then the mind is more powerful than anything, so I denied it, worked for me. people use the sap of this plant to poison their enemy. Some put the liquid at the tip of their arrow, causing immediate death to their targets. Get rid of the plant. Always wear protective gloves when you do gardening. It would be itchy as heck. And it can be relieved by soaking the affected part in cold combo of baking soda and vinegar. I don’t recommend hot water; it gets irritated all the more. So there, I hope this will warn you ladies of how dangerous this plant is. Don’t wait ‘till you or your kids become a victim.